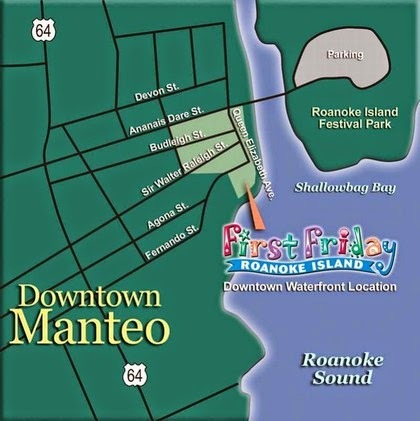 Come to the North Carolina Outer Banks for First Friday, a monthly family-oriented street festival held the 1st Friday of each month, April through December from 6:00 pm to 8:00 pm in Historic Downtown Manteo, along the Waterfront. Come enjoy the sidewalks pulse with live music, magic, artisans, period-dressed actors, a rock-climbing wall and much more. Tantalizing aromas waft from the kitchens of the Waterfront’s diverse eateries. Many shops and restaurants do individual celebrations inside their establishments, offering their own live music, unique merchandise, special sales and light refreshments. Make a day of it on Roanoke Island by visiting our attractions, shops, and art galleries. Enjoy diverse recreational activities for all ages and visit downtown for the monthly First Friday celebration and finish the day with a delicious local seafood food and live entertainment. The First Friday celebration is a great opportunity to spend time with family and friends while exploring the downtown historic district.